Background: Epilepsy and Alzheimer's disease are common neuropathies with a complex pathogenesis. Both of them have some correlations in etiology, pathogenesis, pathological changes, clinical manifestations and treatment. Objective: This study investigated the key genes and molecular genetic mechanism in epilepsy and Alzheimer’s disease by bioinformatics analysis. Method: Two gene expression profiles were used to screen differentially expressed genes by GEO2R tool. The Gene Ontology (GO) and Kyoto Encyclopedia of Gene and Genome (KEGG) pathway enrichment analysis was performed using the Database for Annotation, Visualization and Integrated Discovery (DAVID). Then the protein-protein interaction (PPI) network was constructed by Search Tool for the Retrieval of Interacting Genes (STRING) and Cytoscape software which can be used to analyze modules with MCODE. Results: A total of 199 differentially expressed genes (DEGs) in the two groups. According to GO_BP analysis and KEGG pathway enrichment by DAVID, we found DEGs referring to several pathways significantly down-regulated in endocytosis, such as endocytosis, synaptic vesicle cycle, lysosome, cAMP signaling pathway, circadian entrainment, LTP, glutamatergic synapse and GABAergic synapse pathway. The regulator genes of the upstream pathway of circadian rhythms were obviously downgraded. Conclusion: Our research demonstrated that the regulatory genes of the upstream pathway of circadian rhythms were obviously downgraded. 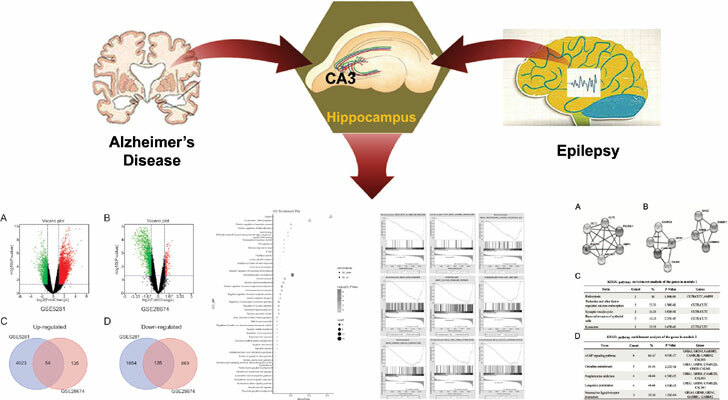 These biological pathways and DEGs or hub genes may contribute to revealing the molecular relationship between Alzheimer's disease and epilepsy. Epilepsy, Alzheimer`s disease, bioinformatics, differentially expressed genes, circadian entrainment, gene ontology.